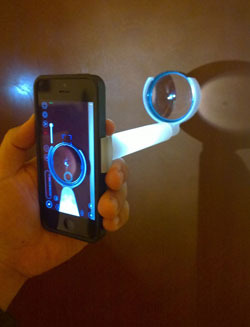 Researchers at Stanford University School of Medicine have developed an iPhone camera add-on called the ‘EyeGo’, that allows anyone with minimal training to capture, store and share high-quality images of the front and back of the eye. The portable iPhone accessory, which is expected to sell for around $90, can replace specialist ophthalmology equipment costing tens of thousands of dollars (via The Loop). Developed by assistant professor Dr. Robert Chang and a resident named Dr. David Myung, the EyeGo was originally prototyped using components that are readily available online. But once the product is ready for mass production, the EyeGo “will be scanned so that it can simply be 3D-printed by anyone wanting one”. The EyeGo clips on to the back of the iPhone and uses two adapters to allow the smartphone’s camera to take close-up photos of the outside of the eye, as well the retina inside by shining light through the eyeball’s lens. Myung and Chang have recently been awarded seed grants from the School of Medicine and the Stanford Biodesign Program to fund the production of the initial batch of adapters.